Guess who actually has a skin care routine for the first time ever?.... that would be me! I am so proud of myself and it seemed to of happened naturally, it was not forced for a change. I have tried and failed at looking after my skin so many times. I have every lotion and potion under the sun but it is rare that I find one that really stands out or does not give me an allergic reaction. I have to be really careful with my skin as it is so sensitive! 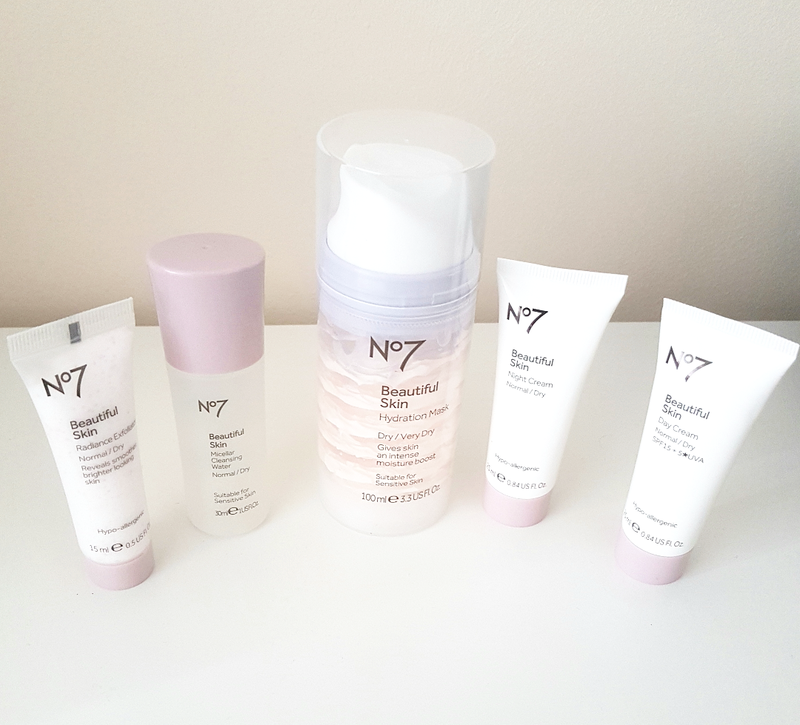 I was lucky enough to be given the No.7 Beautiful skin set for Christmas. I must admit I have never really used the brand before. I like the fact that this set has everything you need in one. I tested each one through out the day after Christmas and fell in love with the products. The fact that my face did not turn into a beetroot and become all itchy was a welcome relief as I seem to be allergic to pretty much everything! There is a part of the month were my skin goes nuts and I break out a lot, this time around using these products my skin stayed beautifully clear. I hate the fact that the cold weather really effects my skin usually, although having a stable routine seemed to protect my skin. This range is especially for dry skin which mine can be. The micellar water removes makeup so effortlessly and it feels weightless. As well as the day and night creams are so light and leave your skin smooth and glorious! I have not tried the mask yet but I am really looking forward to it with a self pamper evening! I have always been told by the strong ladies in my family to cleanse, tone and moisturise from a very young age but with skin care I can be super lazy. This set seems to have really gave me a kick up the back side and the travel size products make it so easy to pop in your bag when your not going to be at home. Perfect! Have you got a skin care holy grail? I would love to know what they are! Hate drying your hair? Me too! I have always had a hatred for the process of washing and drying my hair. I am blessed with thick hair. It is so time consuming that I need to give myself a little pep talk before I begin the lengthy chore. If you feel the same then I may have found a life saver. 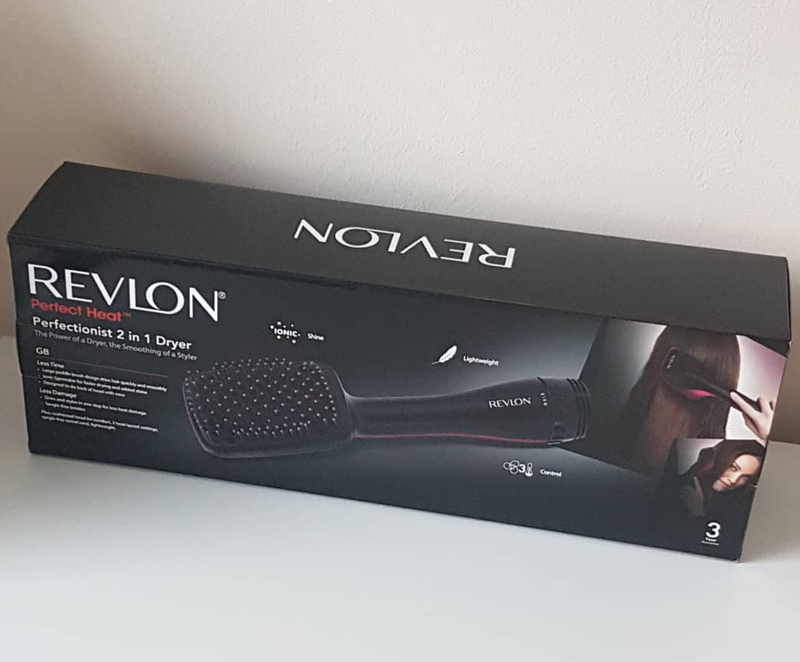 I had been looking at hair tools to make drying my hair easier when I came across the Revlon Perfectionist 2 in 1 Hair Dryer. 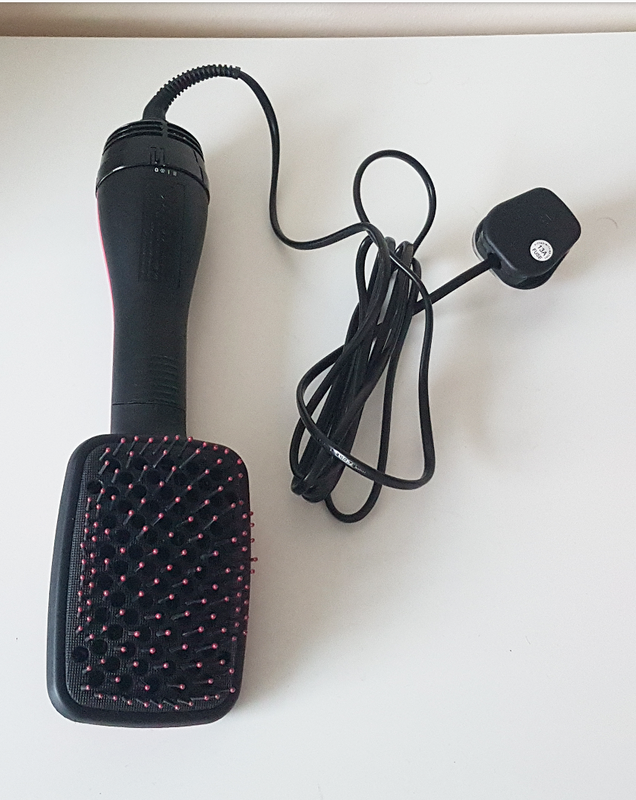 This beauty combines a powerful hair dryer with a paddle brush so you can dry sections easily and very quickly! Which for me is a miracle! It comes with the usual warm, hot and cool settings that you would find on a hair dryer. It gets rid of tangles and leaves your hair silky smooth with Ionic technology. It seems to protect my hair from that hair dryer frizz that I am cursed with. I honestly felt like I had just left the hair dressers after a blow dry. I do find that after having my hair dried in a salon. My hair seems a little flat and it did seem to have the same effect after using the styler. Although with a little hair product and a bit of a boost with a comb I had the style I prefer. I really feel like this is going to change my routine for the better!